As parents, one of our most basic jobs is to feed our children. It sounds simple enough. But when your child is especially selective about what they eat, it can become a logistical and emotional nightmare. When a child has a very limited food repertoire, mealtimes can become stressful. Many parents try to cajole, persuade, beg, bribe, or threaten their children into eating different foods. 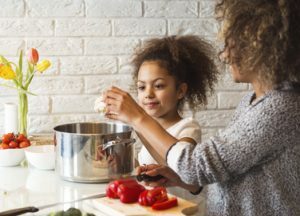 These actions are rarely met with success, and even if they work in the moment, they do nothing to encourage the child to develop a positive relationship with food. 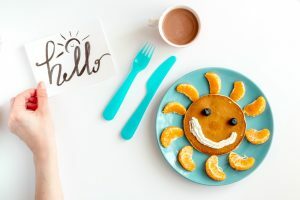 So how can you make the dinner table less threatening for children who struggle with selective eating, and less stressful for you as parents? Here are some tips to help you encourage your child to eat well. We all live up to the names we are given, good or bad. If you tell everyone that your child is a ‘picky eater’, he will believe that. Instead, try to avoid discussing the topic in his presence. If that is not possible, be mindful of the words you use. You could say something along the lines of “Harry is still learning to like carrots. He may want to try them today. Let’s ask him and see.” If Harry overhears this conversation, it tells him that food preferences change over time, and he is in control of when to try new foods. That is more encouraging and less stressful than hearing himself referred to as a ‘picky eater’. Let them know it is ok that they only eat a few foods right now, and that it might change in the future. Food preferences are always evolving. If your child understands that, they are more likely to try in the future something they do not want to try today. Talk about how food looks, smells, feels, what temperature it is, and how it sounds. Encourage them to explore it, with no expectation that they will eat it. It allows them to familiarize themselves with different foods without the stress of having to try them. 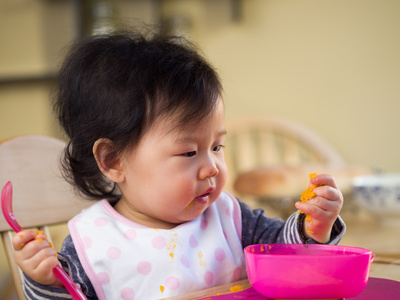 Instead of focusing on getting your child to eat new foods right away, take it in stages. Stage 1 might be tolerating it sitting on their plate. With some children, even stage 1 can be a challenge. Stage 2 might be sniffing it. Stage 3 touching. Then licking, and eventually tasting. Know that it might take weeks or even months to get through all the stages with one food, and that is ok. Just take a deep breath and try to be patient. This might sound controversial. Who wants a child to spit out their food? But if a selective eater knows that they can remove food from their mouth if they don’t like it, they are more likely to give it a try. Teach your child how to politely remove food from their mouth using a napkin, and let them know that it is acceptable to do that if they try a food they don’t like. How many times have you heard your child say, “I don’t like it” before they have even tried something? Just the act of a child saying that to himself can reinforce the idea that he does not like the food. Next time your child makes that declaration, encourage him to say “I don’t feel like trying it today” instead. It reinforces the idea that they may want to try it in the future, and allows them to feel in control of their choices. The parent decides what, when, and where the child will eat. The child decides how much they will eat, if any. In practice, that means that you as the parent decide when and where mealtimes will take place, and what food to put in front of your child. The next part is the hard part. You have to step back and let your child decide how much to eat, if any. It is not easy to do, but over time it has been shown to encourage children to be more accepting of new foods. At the grocery store, ask your child to pick out a new food they might like to try. You could also check out some children’s cookery books from the library, or go online and look at some recipes. Get them involved and excited about mealtimes. Over time, increasing their interest in food will translate into becoming more adventurous at mealtimes. 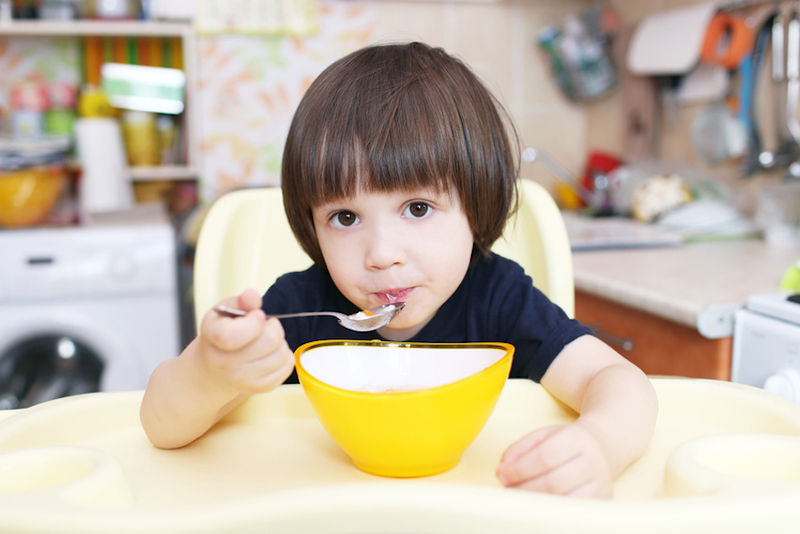 If your child is not hungry at mealtimes, it is going to be even harder to encourage them to eat a variety of foods. Try not to let your child snack in the hour leading up to mealtime. If there is less than one hour to go and your child simply can’t wait, offer them part of their lunch or dinner, or some cut fruit or vegetables. Remember the goal is to make mealtimes stress-free for your child. You want them to come to the table looking forward to the meal. If they are anxious, they are less likely to be adventurous. 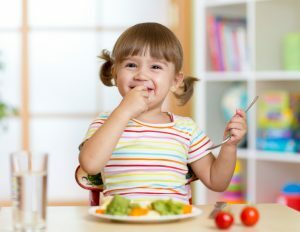 By making sure there are always one or two foods on their plate that they like, you remove a lot of the stress for a child who is selective about what they eat. By this, I don’t mean that you have to start creating art with your child’s meal. However, you can make little changes that will enhance your child’s enjoyment. For example, you could cut vegetables into sticks and give them a dipping sauce, use a cookie cutter to make fun shapes out of sandwiches or sliced cheese, or cut foods into cubes and skewer them onto wooden tooth picks to make kebabs. 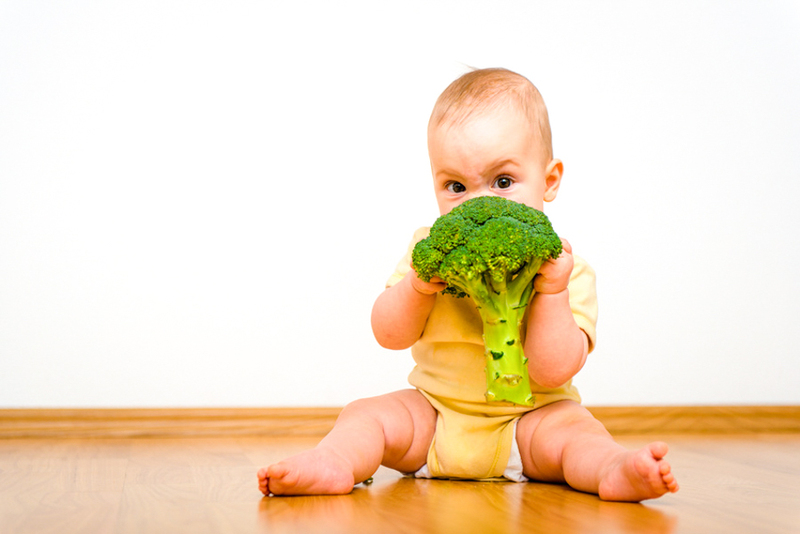 Children often respond well to giving foods interesting names, like monster juice for green smoothies, or baby trees for broccoli. Also, try to make meals colorful and visually appealing, and only put small portions on your child’s plate. Being faced with a huge pile of bland-looking food won’t do much to tease out your child’s adventurous side. Children love to copy their parents. If your child sees you eating a diverse range of foods, they are more likely to do the same. This is especially true if you follow the family style meals tip, because they can pick from the same bowls that you picked from. Family style meals involve putting the food in serving bowls on the dinner table and allowing people to serve themselves. Giving your child control over what he chooses to put on his plate can help relieve anxiety and encourage him to be more adventurous about what he chooses to eat. Tacos or burritos are a great way to do this. Salad bars are another. Just lay it all out and let everyone dig in. Explain to them what it feels like to have a full belly, and tell them that is the goal at mealtimes. Let them know they do not have to finish all the food on their plate if they feel full before that. If they consistently leave lots of food on their plate, try serving them a little less food. You have probably heard it many times before, but children often need exposure to a new food many times before they will try it. Follow the old adage, “if at first you don’t succeed, try try again”. Try to focus on something other than their eating. If your child tries a new food, offer some encouraging words, but don’t make a big deal out of it. Just keep it business as usual. Avoid cajoling, persuading, begging, bargaining, or threatening your child to eat. With this in mind, children will be less fearful of the dinner table. A relaxed child will be more open-minded, which is what we want to achieve. Entering into food battles with your child never ends well. Try to keep mealtimes stress free for your child. You want them to enjoy coming to the dinner table, not dread it because they might be forced to eat something they don’t want. Sometimes, parents of selective eaters are worried about their child’s nutrient intake. If this is you, and your child turns his nose up at vegetables, try hiding some and showing some. You can hide veggies in smoothies, pancakes, or blended sauces. That way you know your child is getting some fresh produce in their diet. Once they like the taste, you can tell them what went into it to help desensitize them to those foods. But only hiding vegetables does not teach your child to like them. So put some in plain view on their plate or on the table in family style meals. That way they can get used to choosing to eat them as well. Help your children understand the importance of food – that it gives you energy, helps your brain work properly, and makes your muscles strong. 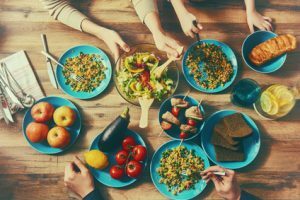 While this is unlikely to bring about any short-term changes in their food intake, over time it will help them see just how important it is to make healthy food choices. 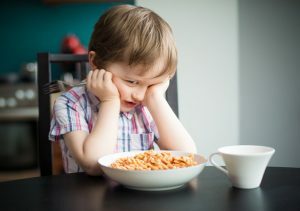 The process of encouraging your child to eat a greater number of foods is often long and fraught with frustration for everyone concerned. Part of that frustration is usually directed at the food waste that inevitably accompanies the process. Try to remember that some waste is unavoidable. When it makes you stressed, remind yourself that you are doing a very important job here. You are teaching your child lifelong habits that will impact their physical and mental health. Food waste is an unfortunate side effect of that, and will hopefully be short lived. If you are at all concerned that what your child is experiencing is more serious than common selective eating, consult their pediatrician. They may benefit from seeing an occupational therapist. 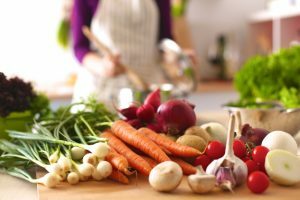 And if you are worried that your child is not getting enough of the nutrients they need, a pediatric Registered Dietitian Nutritionist can help advise you. All of these tips are designed to help you create a relaxed eating environment in which your child is comfortable and confident. You want your child to have a positive relationship with food. That being said, it is likely to be a long and rocky journey for you as parents. Working out how to encourage your child to eat well is not easy. But the effort you put in now will set your child up for a lifetime of healthy eating habits. And in those darker moments when you feel as though you are doing it all wrong, remember this. Just by reading this post and taking steps to help your child, you are doing an amazing job. Keep going. You can do this. It will all be worth it in the long run. Wonderful advice. I am sure it will take me months to apply, but I feel like you have given me tools to approach my child’s picky eating that causes me so much frustration.